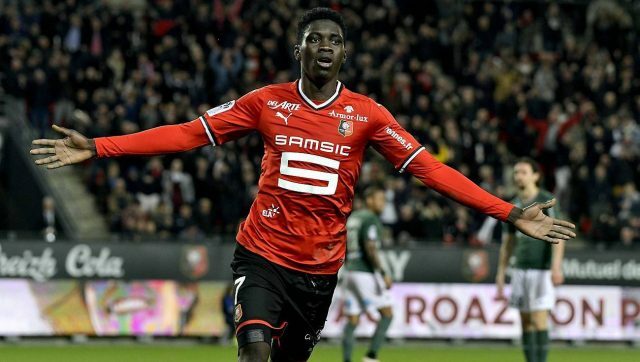 Robert Pires believes Ligue 1 club Rennes winger Ismaila Sarr would be a quality signing to Unai Emery’s roster were he to complete a transfer to Arsenal this summer transfer market. The 21-year-old star has netted ten goals and registered 11 assists in all competitions for his side this season and caught the eye in Rennes’ Europa League tie with the Gunners earlier this month. Ismaila scored the third goal in Les Rouges et Noirs’ 3-1 first-leg victory over North Londoners and reports suggest Arsenal’s opened talks to land the youngster immediately after the final whistle. Former German head of recruitment, Sven Mislintat, pinpointed Sarr as a possible target for Arsenal before he decided to depart from the club last month. Spain international Denis Suarez has been a huge disappointment since his January loan switch from Barcelona and Robert has urged Unai to strongly consider a swoop for Sarri this summer. It’s understood the French side’s management are demanding a sum of £20 million for their prized asset in the summer transfer market. Emery has reportedly been given a transfer budget of around £50 million ahead of the 2019/20 season, but this figure is possible to increase should the club secure Top 4 and qualify for next campaign’s UEFA Champions League.